A playground is much more than just the sum of the play equipment. A successful play area design provides a secure area, away from the hectic everyday life that enables children to relax, enjoy new experiences and communicate. 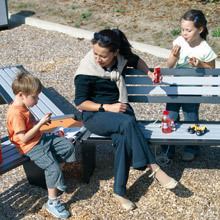 The range of outdoor furniture for recreation areas from Proludic has been designed to respond to the need for a coherent approach to playground design.